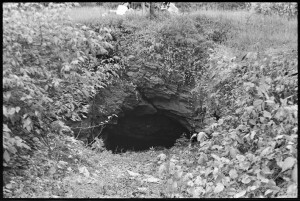 At Soldiers Delight there was placer mining of “sand chrome” along stream beds (e.g., the Triplett, Gore, and Dolfield Buddles) and also ore extraction via open pits and deep mine shafts. 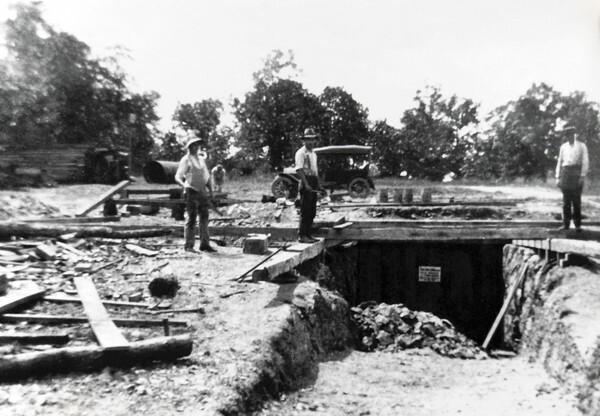 The Weir mine, north of Ward’s Chapel Road, had two vertical shafts as much as 250 feet deep with side drifts, and the Choate mine, east of Deer Park Road, had an angled shaft up to 200 feet long. 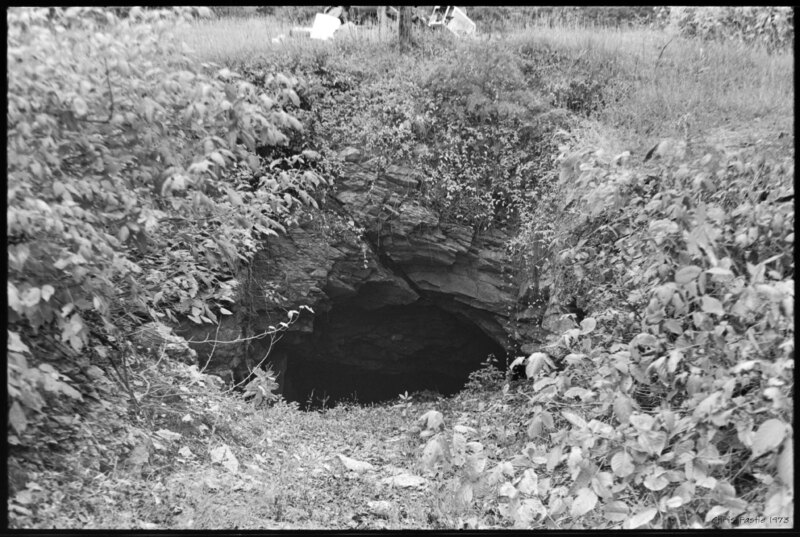 The Harris mine, about a mile northwest of the Choate, had four shafts less than 100 feet deep. The Calhoun mine, two miles north of the Choate, had two shafts, one of which was about 100 feet deep. Two smaller mines were also present. 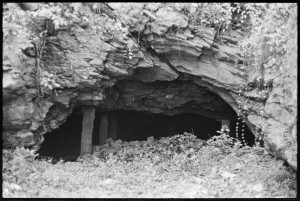 Entrance to the Choate mine in 1917 as it is prepared for renewed operation during World War I. Mine superintendent John Buxton’s 1910 Stoddard-Dayton touring car is beyond. The war ended before much chromite was removed, and the mine was never worked again. Photo by Ted Buxton (I think). In the 1960s we bemoaned the environmental damage being done by the Baltimore Ramblers motorcycle club which allowed dirt bike riding on a large parcel of serpentine barrens they owned. But a century earlier, Soldiers Delight was an industrial mining district that must have been dramatically scarred by surface rock removal, excavated stream valleys, multiple mine shafts, tailings piles, loading docks, haul roads, processing plants, equipment dumps, offices, and employee housing. There is very little information about the effects of this activity, but dozens of people living and doing this kind of work on a fragile landscape at a time when wood fires were the primary means of heating and cooking suggests that the vegetation both in and around the mining area must have been dramatically altered. 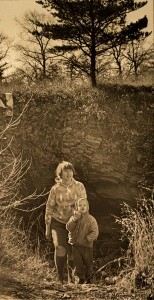 Jean and Asa Worthley at the entrance to the Choate mine in 1967. Tires and other garbage had been thrown into the mine. This photo was part of a December 10, 1967 article in the Baltimore Sunday Sun Recreation section along with photos of Frances Fastie, Ed Hibline, and Florence Rogers. By Ellis J. Malashuk, December 7, 1967. Actually “Chromite was first discovered at the Bare Hills, Baltimore County, Md., between 1808 and 1810” (Pearre and Heyl 1960). Sunpapers Photo by A. Aubrey Bodine, August, 1960. 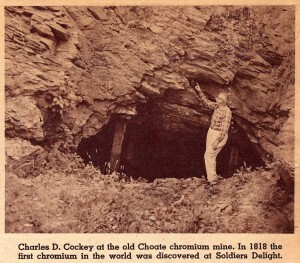 Although the Choate mine was readied for operation again before it closed for good in 1918, and other sporadic mining activity lasted until 1925, most mining in Soldiers Delight had ended by 1880. So the 20th century was a time of recovery for Soldiers Delight vegetation. Serpentine tolerant prairie grasses established on disturbed sites, as they are returning today on the old Baltimore Ramblers property. Trees in the oak forests grew large again after a century of intense harvest, and Virginia pines began to spread across the grasslands. 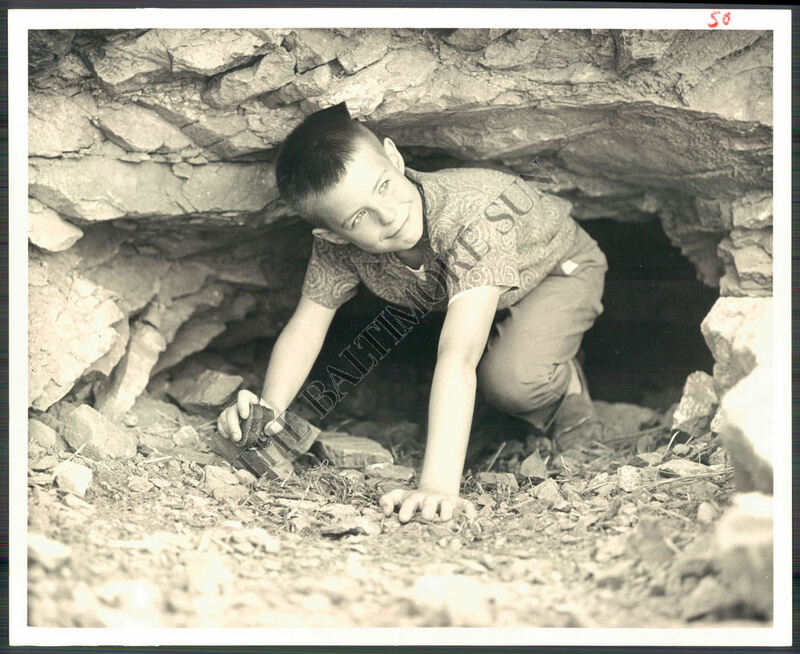 By 1950, Soldiers Delight seemed both wilder and more natural than the surrounding landscape where continuing disturbance by agriculture, logging, or suburban sprawl kept a domesticated ecosystem in a state of early succession and laced with introduced species. In fact, Soldiers Delight had wild beauty in 1960 mostly because it was uninhabited and neglected, and because serpentine soil made it resistant to invasion by exotic weeds. And the serpentine barrens were grassland, a rare and therefore valued habitat in the forested east. This was a unique and fascinating place, and a place worth saving. But in the 1960s, it was moving fast on a successional trajectory away from industrial disturbance. We liked what we saw then, and decided we wanted to keep it just the way we found it. That decision may have suffered from a lack of both hindsight and foresight. Edward Frost at the entrance to a Soldiers Delight mine, probably the one north of Dolfield Road (Site 1). This print is for sale on eBay as part of the Tribune Company’s monetization of several metropolitan newspapers’ photo archives. Photo by William H. Mortimer, May 1964. The history of mining at Soldiers Delight connects people to the landscape, and is appropriately highlighted in current interpretive material. But that history may explain much more about the Soldiers Delight landscape than we realized in the 1960s or have accepted today. It may have largely determined the nature of the plant communities that made so many people work so hard to protect them from change without recognizing that the very nature of those communities was change. Without today’s management plan, some rare species might disappear, but Soldiers Delight would be developing toward a more natural state instead of being nudged awkwardly into the recent past. The attempt to revive some rare species by reversing woody plant succession on hundreds of acres is a grand experiment. The resulting landscape will be largely artificial, so I hope it encourages a few desired species. And I hope some control areas remain so we can eventually learn what a mature serpentine community really looks like at this place. Inside the entrance to the Choate mine. 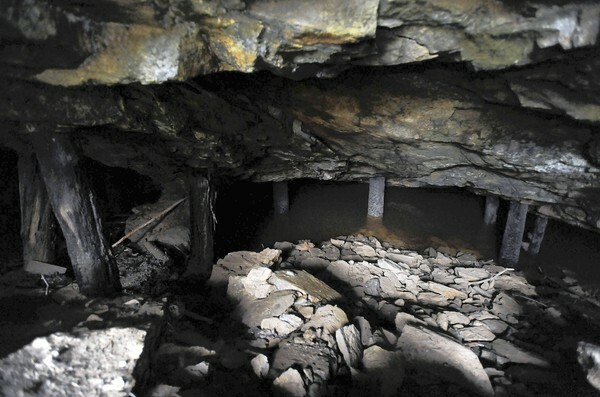 This mine was flooded and wonderfully creepy every time I saw it. Photo by Steve Ruark, October 28, 2012. ‘The Triplett Buddle’ would make a great name for a rock band. Guitar, bass, drums, and on vocals, Placer Domingo?